Almost all families of European descent have coats of arms, some dating from as early as the 12th century. 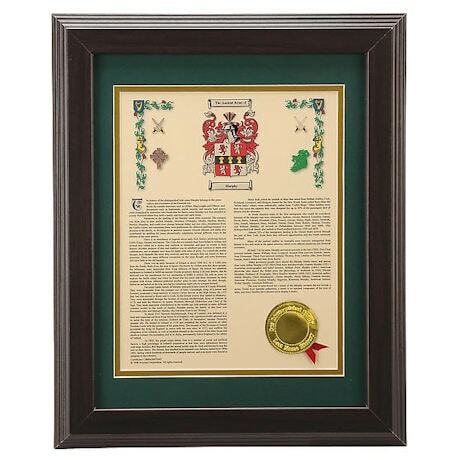 Yours will come with a full color rendition of the earliest coat of arms associated with your name, along with information on the ancient origin of your name, variations, your name through history, noteworthy bearers, and a unique certificate number. Printed on acid-free ivory card stock, double-matted and framed in dark wood under Plexiglas®. 11" x 14". Specify name (24 characters maximum) and country; over 1 million names are available. Allow 3-4 weeks for delivery. No Rush or Express. Ships to 48 contiguous states only. Does not ship to Canada. Seal on frame says "Our distinguished family name history"